Considered together, Bohm and Pribram's theories provide a profound new way of looking at the world: Our brains mathematically construct objective reality by interpreting frequencies that are ultimately projections from another dimension, a deeper order of existence that is beyond both space and time: The brain is a hologram folded in a holographic universe. For Pribram, this synthesis made him realize that the objective world does not exist, at least not in the way we are accustomed to believing. What is "out there" is a vast ocean of waves and frequencies, and reality looks concrete to us only because our brains are able to take this holographic blur and convert it into the sticks and stones and other familiar objects that make up our world. How is the brain (which itself is composed of frequencies of matter) able to take something as insubstantial as a blur of frequencies and make it seem solid to the touch? "The kind of mathematical process that Bekesy simulated with his vibrators is basic to how our brains construct our image of a world out there," Pribram states. In other words, the smoothness of a piece of fine china and the feel of beach sand beneath our feet are really just elaborate versions of the phantom limb syndrome. According to Pribram this does not mean there aren't china cups and grains of beach sand out there. It simply means that a china cup has two very different aspects to its reality. When it is filtered through the lens of our brain it manifests as a cup. But if we could get rid of our lenses, we'd experience it as an interference pattern. Which one is real and which is illusion? "Both are real to me," says Pribram, "or, if you want to say, neither of them are real." This state of affairs is not limited to china cups. We, too, have two very different aspects to our reality. We can view ourselves as physical bodies moving through space. Or we can view ourselves an a blur of interference patterns enfolded throughout the cosmic hologram. Bohm believes this second point of view might even be the more correct, for to think of ourselves as a holographic mind/brain looking at a holographic universe is again an abstraction, an attempt to separate two things that ultimately cannot be separated. Do not be troubled if this is difficult to grasp. It is relatively easy to understand the idea of holism in something that is external to us, like an apple in a hologram. What makes it difficult is that in this case we an not looking at the hologram. We are part of the hologram. The difficulty is also another indication of how radical a revision Bohm and Pribram are trying to make in our way of thinking. But it is not the only radical revision. Pribram's assertion that our brains construct objects pales beside another of Bohm's conclusions: that we even construct space and time. The implications of this view are just one of the subjects that will be examined as we explore the effect Bohm and Pribram's ideas have had on the work of other fields. interference patterns recorded on a piece of holographic film also appear disordered to the naked eye. Both possess orders that are hidden or enfolded in much the same way that the order in a plasma is enfolded in the seemingly random behavior of each of its electrons. But this was not the only insight the hologram provided. The more Bohm thought about it the more convinced he became that the universe actually employed holographic principles in its operations, was itself a kind of giant, flowing hologram, and this realization allowed him to crystallize all of his various insights into a sweeping and cohesive whole. He published his first papers on his holographic view of the universe in the early 1970s, and in 1980 he presented a mature distillation of his thoughts in a book entitled _Wholeness and the Implicate Order_. In it he did more than just link his myriad ideas together. He transfigured them into a new way of looking at reality that was as breathtaking as it was radical. One of Bohm's most startling assertions is that the tangible reality of our everyday lives is really a kind of projection, like a holographic image. Underlying it is a deeper order of existence, a vast and more primary level of reality that gives birth to all the objects and appearances of our physical world in much the same way that a piece of holographic film gives birth to a hologram. Bohm calls this deeper level of reality the Implicate (which means "enfolded") order, and he refers to our own level of existence as the explicate, or unfolded, order. He uses these terms because he sees the manifestation of all forms in the universe as the result of countless enfoldings and unfoldings between these two orders. For example, Bohm believes an electron is not one thing but a totality or ensemble enfolded throughout the whole of space. When an instrument detects the presence of a single electron it is simply because one aspect of the electron's ensemble has unfolded, similar to the way an ink drop unfolds out of the glycerine, at that particular location. When an electron appears to be moving it is due to a continuous series of such unfoldments and enfoldments. Put another way, electrons and all other particles are no more substantive or permanent than the form a geyser of water takes as it gushes out of a fountain. They are sustained by a constant influx from the implicate order, and when a particle appears to be destroyed, it is not lost. It has merely enfolded back into the deeper order from which it sprang. 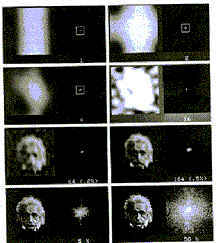 A piece of holographic film and the image it generates are also an example of an implicate and explicate order. The film is an implicate order because the image encoded in its interference patterns is a hidden totality enfolded throughout the whole. The hologram projected from the film is an explicate order because it represents the unfolded and perceptible version of the image. The constant and flowing exchange between the two orders explains how particles, such as the electron in the positronium atom, can shapeshift from one kind of particle to another. Such shiftings can be viewed as one particle, say an electron, enfolding back into the implicate order while another, a photon, unfolds and takes its place. It also explains how a quantum can manifest as either a particle or a wave. According to Bohm, both aspects are always enfolded in a quantum's ensemble, but the way an observer interacts with the ensemble determines which aspect unfolds and which remains hidden. As such, the role an observer plays in determining the form a quantum takes may be no more mysterious than the fact that the way a jeweller manipulates a gem determines which of its facets become visible and which do not. Because the term hologram usually refers to an image that is static and does not convey the dynamic and ever active nature of the incalculable enfoldings and unfoldings that moment by moment create our universe, Bohm prefers to describe the universe not as a hologram, but as a holomovement." The existence of a deeper and holographically organized order also explains why reality becomes nonlocal at the subquantum level. As we have seen, when something is organized holographically, all semblance of location breaks down. Saying that every part of a piece of holographic film contains all the information possessed by the whole is really just another way of saying that the information is distributed nonlocally. Hence, if the universe is organized according to holographic principles, it, too, would be expected to have nonlocal properties. Most mind-boggling of all are Bohm's fully developed ideas about wholeness. Because everything in the cosmos is made out of the seamless holographic fabric of the implicate order, he believes it is as meaningless to view the universe as composed of "parts," as it is to view the different geysers in a fountain as separate from the water out of which they flow. An electron is not an "elementary particle." It is Just a name given to a certain aspect of the holomovement. Dividing reality up into parts and then naming those parts is always arbitrary a product of convention, because subatomic particles, and everything else in the universe, are no more separate from one another than different patterns in an ornate carpet. This is a profound suggestion. In his general theory of relativity Einstein astounded the world when he said that space and time are not separate entities, but are smoothly linked and part of a larger whole he called the space-time continuum. Bohm takes this idea a giant step further. He says that everything in the universe is part of a continuum. Despite the apparent separateness of things at the explicate level, everything is a seamless extension of everything else, and ultimately even the implicate and explicate orders blend into each other. Take a moment to consider this. Look at your hand. Now look at the light streaming from the lamp beside you. And at the dog resting at your feet. you are not merely made of the same things. You are the same thing. One thing. Unbroken. One enormous something that has extended its uncountable arms and appendages into all the apparent objects, atoms, restless oceans, and twinkling stars in the cosmos. of our problems, not only in science but in our lives and our society as well. For instance, we believe we can extract the valuable parts of the earth without affecting the whole. We believe it is possible to treat parts of our body and not be concerned with the whole. We believe we can deal with various problems in our society such as crime, poverty, and drug addiction, without addressing the problems in our society as a whole, and so on. In his writings Bohm argues passionately that our current way of fragmenting the world into parts not only doesn't work, but may even lead to our extinction. In addition to explaining why quantum physicists find so many examples of interconnectedness when they plumb the depths of matter, Bohm's holographic universe explains many other puzzles. One is the effect consciousness seems to have on the subatomic world. As we have seen, Bohm rejects the idea that particles don't exist until they are observed. But he is not in principle against trying to bring consciousness and physics together. He simply feels that most physicists go about it the wrong way, by once again trying to fragment reality and saying that one separate thing, consciousness, interacts with another separate thing, a subatomic particle. Because all such things are aspects of the holomovement, he feels it has no meaning to speak of consciousness and matter as interacting. In a sense, the observer is the observed. The observer is also the measuring device, the experimental results, the laboratory, and the breeze that blows outside the laboratory. In fact, Bohm believes that consciousness is a more subtle form of matter, and the basis for any relationship between the two lies not in our own level of reality, but deep in the implicate order. Consciousness is present in various degrees of enfoldment and unfoldment in all matter, which is perhaps why plasmas possess some of the traits of living things. As Bohm puts it, "The ability of form to be active is the most characteristic feature of mind, and we have something that is mindlike already with the electron." Similarly, he believes that dividing the universe up into living and nonliving things also has no meaning. Animate and inanimate matter are inseparably interwoven, and life, too, is enfolded throughout the totality of the universe. Even a rock is in some way alive, says Bohm, for life and intelligence are present not only in all of matter, but in "energy," "space," "time," "the fabric of the entire universe," and everything else we abstract out of the holomovement and mistakenly view as separate things. If our universe is only a pale shadow of a deeper order, what else lies hidden, enfolded in the warp and weft of our reality? Bohm has a suggestion. According to our current understanding of physics, every region of space is awash with different kinds of fields composed of waves of varying lengths. Each wave always has at least some energy. When physicists calculate the minimum amount of energy a wave can possess, they find that every cubic centimeter of empty space contains more energy than the total energy of all the matter in the known universe! fabric, the deeper order of the crystal. Bohm believes the same is true at our own level of existence. Space is not empty. It is full, a plenum as opposed to a vacuum, and is the ground for the existence of everything, including ourselves. The universe is not separate from this cosmic sea of energy, it is a ripple on its surface, a comparatively small "pattern of excitation" in the midst of an unimaginably vast ocean. "This excitation pattern is relatively autonomous and gives rise to approximately recurrent, stable and separable projections into a three-dimensional explicate order of manifestation," states Bohm. In other words, despite its apparent materiality and enormous size, the universe does not exist in and of itself but is the stepchild of something far vaster and more ineffable. More than that, it is not even a major production of this vaster something but is only a passing shadow, a mere hiccup in the greater scheme of things. This infinite sea of energy is not all that is enfolded in the implicate order. Because the implicate order is the foundation that has given birth to everything in our universe, at the very least it also contains every subatomic particle that has been or will be; every configuration of matter, energy, life, and consciousness that is possible, from quasars to the brain of Shakespeare, from the double helix, to the forces that control the sizes and shapes of galaxies. And even this is not all it may contain. Bohm concedes that there is no reason to believe the implicate order is the end of things. There may be other un dreamed of orders beyond it, infinite stages of further development. ...........................our current worldview does not provide us with a context with which to understand PK (psychokinesis ). Bohm believes viewing the universe as a holomovement does provide us with a context. To explain what he means he asks us to consider the following situation. Imagine you are walking down a street late one night and a shadow suddenly looms up out of nowhere. Your first thought might be that the shadow is all assailant and you are in danger. The information contained in this thought will in turn give rise to a range of imagined activities, such as running, being hurt, and fighting. The presence of these imagined activities in your mind, however, is not a purely "mental" process, for they are inseparable from a host of related biological processes, such as excitation of nerves, rapid heart beat, release of adrenaline and other hormones, tensing of the muscles, and so on. Conversely, if your first thought is that the shadow is just a shadow, a different set of mental and biological responses will follow. Moreover, a little reflection will reveal that we react both mentally and biologically to everything we experience. According to Bohm, the important point to be gleaned from this is that consciousness is not the only thing that can respond to meaning. The body can also respond, and this reveals that meaning is simultaneously both mental and physical in nature. This is odd, for we normally think of meaning as something that can only have an active effect on Subjective reality, on the thoughts inside our heads, not something that can engender a response in the physical world of things and objects. Meaning can thus serve as the link or 'bridge' between these two sides of reality," Bohm states. "This link is indivisible in the sense that information contained in thought, which we feel to be on the 'mental' side, is at the same time a neurophysiological, chemical, and physical activity, which is clearly what is meant by this thought on the 'material' side." is the behavior of subatomic particles. The orthodox view in physics is that quantum waves act mechanically on a particle, controlling its movement in much the same way that the waves of the ocean might control a Ping-Pong ball floating on its surface. But Bohm does not feel that this view can explain, for example, the coordinated dance of electrons in a plasma any more than the wave motion of water could explain a similarly well-choreographed movement of Ping-Pong balls if such a movement were discovered on the ocean's surface. He believes the relationship between particle and quantum wave is more like a ship on automatic pilot guided by radar waves. A quantum wave does not push an electron about any more than a radar wave pushes a ship. Rather, it provides the electron with information about its environment which the electron then uses to maneuver on its own. In other words, Bohm believes that an electron is not only mindlike, but is a highly complex entity, a far cry from the standard view that an electron is a simple, Structureless point. The active use of information by electrons, and indeed by all Subatomic particles, indicates that the ability to respond to meaning is a characteristic not only of consciousness but of all matter. It is this intrinsic commonality, says Bohm, that offers a possible explanation for PK. He states, "On this basis, psychokinesis could arise if the mental processes of one or more people were focused on meanings that were in harmony with those guiding the basic processes of the material systems in which this psychokinesis was to be brought about." It is important to note that this kind of psychokinesis would not be due to a causal process, that is, a cause-and-effect relationship involving any of the known forces in physics. Instead, it would be the result of a kind of nonlocal " resonance of meanings," or a kind of nonlocal interaction similar to, but not the same as, the nonlocal interconnection that allows a pair of twin photons to manifest the same angle of polarization which we saw in chapter 2 (for technical reasons Bohm believes mere quantum nonlocality cannot account for either PK or telepathy, and only a deeper form of nonlocality, a kind of "super"nonlocality", would offer such an explanation).